WASHINGTON, D.C. – The payday lending industry’s special interest trade group, the Community Financial Services Association (CFSA), recently chastised the Consumer Financial Protection Bureau (CFPB) in a press release bearing the accusatory headline, “CFPB Buried, Ignored Positive Payday Loan Customer ‘Tell Your Story’ Testimonials It Requested.” What the industry-backed group neglected to mention in its release is that many of these supposedly “personal” submissions, included some of the exact same sentences and paragraphs. Today, Allied Progress called on the CFPB to more closely scrutinize the pro-industry “personal” stories it receives, as well as public comments submitted in opposition to its proposed rule on payday, vehicle title, and other high-cost installment loans. The request follows an analysis by the organization that identified purportedly unique stories and comments submitted directly to the CFPB in opposition to the proposed rule and in support of the payday lending industry which included an alarming number of identical passages. Allied Progress made its request for greater scrutiny as part of its own public comment letter to the CFPB concerning the proposed payday lending rule. The organization also identified specific examples of unethical behavior exhibited by the payday lending industry and its allies in their attempts to influence regulatory policy. For example, Allied Progress pointed to the industry-supportive astroturf group Protect America’s Consumers, noting that “the only person publicly affiliated with the group, its CEO Steve Gates, once worked for an organization that was caught faking grassroots activity, even forging letters to members of Congress.” Citing another example, the pro-payday group Arizona Financial Choice Association organized a purported letter-writing campaign of borrowers supporting pro-industry legislation. In this case, a State Attorney General investigation was requested when it was revealed some of the borrowers who supposedly sent letters of support to state legislators did not recall signing the letters at all. The public comment letter from Allied Progress points to a recent VICE exposé that may explain why comments received by the CFPB in opposition to the rule are so similar. According to the report, “months before [the CFPB] proposed a new rule threatening the profits of exploitative payday lenders across America, the industry’s leaders gathered at a posh resort in the Bahamas to prepare for war.” During a breakout session titled “Take Action in the Rulemaking Process Comment Period,” attendees were told that “a team of three full-time writers” had been retained to assist with comment writing. By deluging the CFPB with individual comments, the author went on to note, lenders could “keep the payday loan party going” and force the agency to “wade through hundreds of thousands of comments.” As CFSA head Dennis Shaul explained, the result is a “bogged down” CFPB. Thank you for the opportunity to file this comment in response to the Consumer Financial Protection Bureau’s (CFPB) proposed rule on payday, vehicle title, and other high cost installment loans. We believe that this rule is critically important to the financial well-being of hardworking Americans who are being targeted by predatory lenders that seek to profit by trapping consumers in difficult to escape cycles of debt. The payday lending industry and the shadowy astroturf front groups supporting its objectives have a history of deceptive practices when it comes to pushing lawmakers to support or oppose regulations. Hundreds of comments that have already been received by the CFPB from borrowers in opposition to this rule, although designed to look personal and authentic, include the exact same phrasing, thus calling into question their authenticity. It should come as no surprise that the payday lending industry might attempt to influence the CFPB’s rulemaking process through potentially underhanded means. Such a history of industry-sanctioned deception should be taken into consideration when weighing the comments received by the CFPB in opposition to this rule. Similarly, the background of those running these industry-backed organizations should also be considered. It is that last category of comments that a cursory review reveals to be most troublesome. The CFPB has received hundreds of individually submitted comments opposing the proposed rule that appear on first glance to be unique but upon further examination, include many of the exact same phrases. Furthermore, when these repeatedly used phrases are entered into search engines, they return no matching results. “There are no other products out there that give you the freedom that a pay day loan can give you,” appears in at least forty-three different stories. “It was a very efficient process and definitely the most reasonable option for me,” appears in at least eighteen different stories. “Medical bills can be very difficult to get under control and are very confusing. This loan was a great solution for me,” appeared in at least twenty-eight different stories. “After doing a little research online, I found that payday loans were exactly the option I needed. I was able to walk in and sit down with someone who explained everything easily to me and I got my money in no time,” appeared in at least fifteen different stories. “To avoid bouncing a check, I turned to a loan to help pay some bills. I found that it was a great choice for me and I was able to pay my power bill on time and without penalty,” appeared in at least forty-nine different stories. “These can really put a hurt on our wallet but after getting a short-term loan, we do not have to worry as much about the payments and can focus on staying healthy,” appeared in at least thirty different stories. “I’ve recommended pay day loans to people and used them myself, and everyone I’ve talked to has had a good experience and is grateful for the small loans they get. I’m not sure what many of us would do if we could not take out these loans any more. The government should leave them alone since they help so many families,” appeared in at least seventeen different stories. “I work long hours and do not have time to get to a regular bank or wait for my paycheck to clear so I can pay bills. I do not have confidence that the bank will work with me when I’m in a pinch for cash, but I know that a payday loan shop will. They get that I need money right away and will pay the advance back as soon as I can, without a bunch of paperwork or surprises,” appeared in at least twenty-two different stories. The stories submitted are not identical. They do not appear to be the result of an online petition. In fact, the CFPB’s “Tell Your Story” portal does not offer any sample language.9 Instead, these stories are largely unique but include a suspiciously significant number of identical sentences and paragraphs. It is important to note that our review of these CFSA-championed stories was not comprehensive. A more thorough examination would undoubtedly turn up many more examples of identical phrasing appearing in these purportedly personal story submissions. Like the “Tell Your Story” submissions praising payday loans, many of the comments submitted in opposition to the CFPB’s proposed rule include identical phrasing. Again, these submissions are not the result of an online petition. They were submitted independently and individually to the CFPB. When the phrasing is entered into a search engine it returns no matches. So, it is not as if these individuals are finding these sentences online and independently deciding to use them in their respective comments. Even though I had insurance to help cover some of the costs of my car repair, I still needed some extra money to get a rental. Payday loans gave me the money so I could afford it and I’m glad they were able to help me. I can afford my phone bill most of the time, but there are times that I have extra costs that do not fit my budget. To keep my budget on track, I rely on pay day loans. Without these loans, I would not have anywhere else to go when the bills get too high. I’m afraid that this limit will leave me with no options if I’m in a bind. The new CFPB rules will only hurt me and won’t solve anything. Shutting down payday loan stores would hurt the many families that rely on these loans in order to stay out of bankruptcy. It is important to keep this loan option as it is. This exercise could be repeated time and again to turn up hundreds, if not thousands of other examples of supposedly personal and unique comments submitted directly to the CFPB in opposition to its proposed rule that include at least some of the exact same sentences found in the comments of other individuals. It is the responsibility of the CFPB to evaluate the comments it receives concerning its proposed rule on their merits. Based on the evidence Allied Progress has unearthed of payday lending industry front groups participating in questionable advocacy tactics, and of supposedly personal and unique industry supportive comments being submitted with the exact same phrasing found in other submissions, it is clear that additional scrutiny over comments opposing the CFPB’s proposed rule is warranted. Ultimately, we want this rule to protect Americans from predatory lending practices that could trap them in cycles of debt and keep them from financial stability. In all of our engagements concerning this rule, we have worked to amplify the real voices of hardworking Americans struggling to make ends meet. Unfortunately, we cannot say the same for the payday lending industry. Thank you for your thoughtful consideration of our comment. If you have any questions or need additional information, please don’t hesitate to contact me directly at XXXX@alliedprogress.org or 855-253-7747. 1 “Rep. 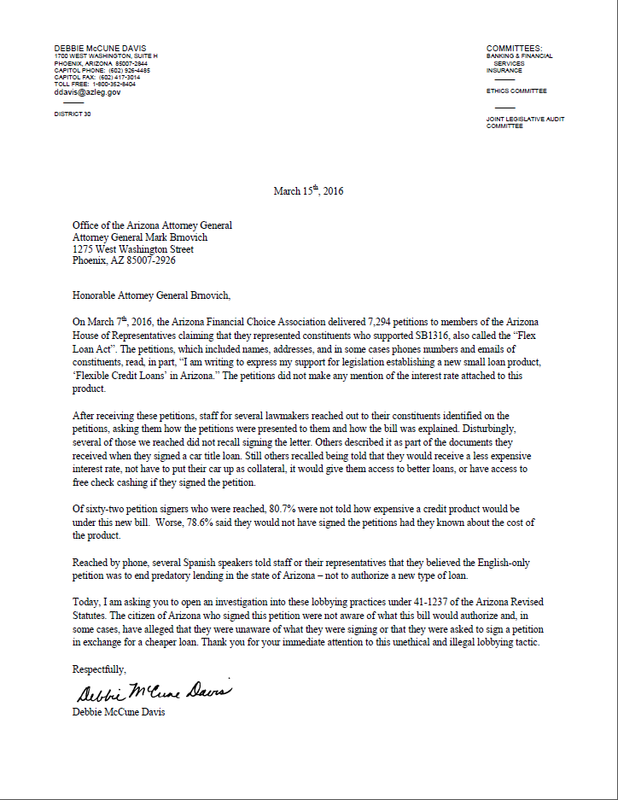 McCune Davis Asks AG to Investigate Arizona Financial Choice Association for Misrepresentation,” Arizona House Democrats website, March 15, 2016, accessed September 13, 2016, http://www.azhousedemocrats.com/2016/03/rep-mccune-davis-asks-ag-to-investigate.html. Of special note is the letter from Rep. McCune Davis to Attorney General Mark Brnovich, dated March 15, 2016: https://4.bp.blogspot.com/-M26kYJrJQEY/VuhrW4ZguhI/AAAAAAAACX0/W7LP-Npj9gIKbDvXN_kXVi8ISCnSevmOA/s1600/Letter+to+AG.png. 2 “Reality Check: Shadowy Front Group Running Grossly Misleading Ads About CFPB Pay and Office Construction Costs,” Allied Progress website, February 24, 2016, accessed September 13, 2016, http://aldpr.gs/1T7pt8l; “Latest ‘Protect America’s Consumers’ Ads Targeting Senators Riddled with Misinformation,” Allied Progress website, April 11, 2016, accessed September 13, 2016, http://aldpr.gs/1VP93kw; and “Shady Astroturf Group Creates Anti-CFPB Attack Ad About Pretend Donors to Pretend Campaign,” Allied Progress website, May 4, 2016, accessed September 13, 2016, http://aldpr.gs/1VK82vC. 7 “CFPB Buried, Ignored Positive Payday Loan Customer ‘Tell Your Story’ Testimonials It Requested,” September 6, 2016, Community Financial Services Association of America website, accessed September 13, 2016, http://cfsaa.com/our-resources/communications/recent-news/article-detail/newsid/131.aspx. 10 “Comment Sumbitted by Miko Jaleel” on the CFPB Proposed Rule: Payday, Vehicle Title, and Certain High-Cost Installment Loans,” Regulations.gov website, accessed September 13, 2016, https://www.regulations.gov/document?D=CFPB-2016-0025-6334. 11 Docket Browser Results (101) from search of Comments on CFPB-2016-0025, Regulations.gov website, accessed September 15, 2016, http://bit.ly/2c8Vmid. 12 Docket Browser results (69) from search of Comments on CFPB-2016-0025, Regulations.gov website, accessed September 15, http://bit.ly/2c770VP. 13 Docket Browser Results (20) from search of Comments on CFPB-2016-0025, Regulations.gov website, accessed September 15, 2016, http://bit.ly/2cEcj4O. 14 Docket Browser Results (80) from search of Comments on CFPB-2016-0025, Regulations.gov website, accessed September 15, 2016, http://bit.ly/2c78Q9g. 15 Docket Browser Results (50) from search of Comments on CFPB-2016-0025, Regulations.gov website, accessed September 15, 2016, http://bit.ly/2cHa2Ti. 16 Docket Browser Results (94) from search of Comments on CFPB-2016-0025, Regulations.gov website, accessed September 15, 2016, http://bit.ly/2c78TSu. To speak with Allied Progress about this release, please contact Lia Weintraub at 860-803-4812 or lia@thepastorumgroup.com. Allied Progress uses hard-hitting research and creative campaigns to hold powerful special interests accountable and empower hardworking Americans.